Masha, May God Bless You! This is an impression from a huge fan’s view, not objectively at all !!! I haven’t written articles for a long long time, mostly I am focus on providing RG information in my website. One reason is because I am not good in writing, and my English is poor. Few days ago, a Chinese girl invited me to write an article about “小tt” for their platform in WeChat. (“小tt” is the nickname I call Masha, now I like to call her “臭小t” and I also love to call her my little daughter XDD) It’s a chance to introduce Masha to Chinese RG fans so I accepted their invitation. It’s difficult for me to write about Masha, because I am a big fan of her, I can’t write her objectively. I treat her as my little daughter (Zhenya is my elder daughter XD), in a mother’s eyes, her child is always good no matter what (laughing). I am a big fan of Zhenya Kanaeva, I followed her since 2008 Beijing OG. In 2012, I had a premonition; Zhenya would retire after London OG. That’s why I tried my best to fly to London to watch her competing. Honestly I am more like a fan for gymnasts than a fan for this sport. Before I always thought I would less concern RG gradually, at least I won’t have the same passion to follow RG once Zhenya retires. But last year, in a Russian RG competition, I saw Maria Titova, I found her graceful and elegant. She gave me a good impression since then. Time after time, I like her more and more, she becomes my favorite gymnast after the retirement of Zhenya. Not like Zhenya, Masha is very unstable. Zhenya is very good in this term, she rarely had big mistakes. Masha’s skill can’t compare with Zhenya. I watched some Masha’s videos when she was junior, 90% of them she made mistakes and she made huge mistakes frequently ><. I think many people would like to know as a Zhenya’s big big fan why I love Masha? She is such unstable. Frankly speaking, liking a gymnast not necessary connected with results or she must be on the top, if a gymnast can touch you in some parts you would love her. I would say it’s fate that I meet Masha and love her haha. Masha’s quality is sooo good, I can’t help to fall in love with her. Her body line and proportion is sooo good, long arms, long legs, long neck and wide shoulder. And her face is sooo pretty, but the most specially is her graceful style. Her elegant is nature born. She is blessed by GOD. Honestly, I always prefer good looking gymnasts. Masha not only has beautiful face but also very graceful, it’s very difficult for me for not loving her hehe. IMO, I think Masha is the most beautiful gymnast in Russian national team, also the most elegant. You can’t have grace by practicing, her skill is not good enough, but she can improve it by training. So I still have hope on her. And actually she improves a lot in these two years. Masha began to do gymnastics at the age of five when she was noticed by one RG coach on the street and invited to the gym. (check here) In 2011 when she was junior she ever competed in 4th Russian and Chinese Youth Games, she won gold, silver and bronze medals in this competition. Check her hoop routine in the event, a very aristocratic routine. Music is from “Apartment” soundtrack. When she was junior, she was a member in the 2nd team. But Irina Viner noticed her, in her last year in junior Irina Viner brought her to Novogorsk training center. So since last year she becomes the member of the front line of Russian national team. Masha was sent to compete in some competitions of World Cup and Grand Prix series last year. Among those events, she won gold in ribbon in GP Holon, gold in hoop in WC Bucharest, silver in AA and ball in WC Pesaro, silver in AA/hoop/ball in GPF Berlin. Seems many RG fans can’t understand why Irina Viner chose Masha? At this moment, Masha is Viner’s favorite. Last year, in the pre-press conference of GP Moscow, Irina Viner said in order to polish Masha’s swan lake hoop. She took Masha to the ballet to make her become the ‘black swan’. She saw the ballet with the best dancer of the Bolshoy Theater Svetlana Zakharova (read Viner’s interview here). This showed Irina Viner has great expectation on Masha. She praised Masha many times in her interviews, said Masha has no equal in the world in terms of gymnastics and beauty (check here). When I read this interview I thought Irina Viner is the biggest fan of Masha hahaha. Irina Viner even said Masha is much alike with the legend ballerina Maya Plisetskaya XDD (check here). Then I checked Maya Plisetskaya’s photos when she was young. Indeed, in some angle, they are alike. Especially when Masha raises her head and smile. 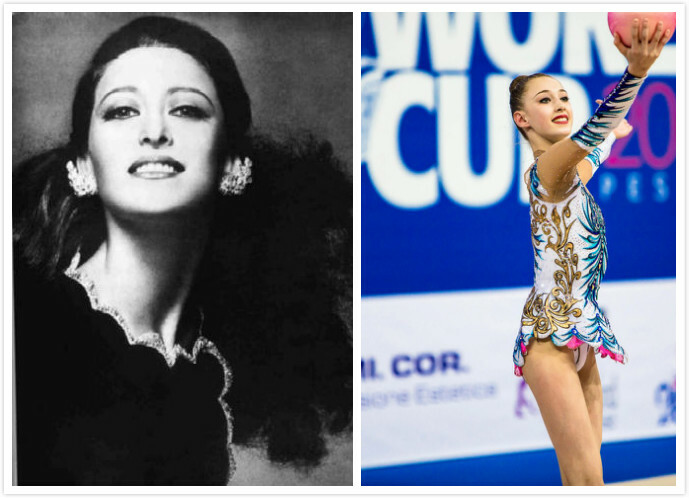 Following photo, left is Maya Plisetskaya, right is Masha, they look similar right XD? Masha is very talented in ballet. After watching her swan lake hoop, some of my friends said she did those ballet movements very well. Seems she have learned ballet many years. They even asked me to find out Masha’s background. In the end, I found a chance to ask Masha directly, that was in April last year, I asked her “if you have ever learned ballet before?” she told me “I do ballet every day for six months”. Only SIX months at that time!!! All my friends shocked, they watched ballet and RG. My friends said it’s a pity Masha didn’t do ballet. She looked like doing ballet for 6 years not just 6 months. One of my friends even joked it’s her apparatus handling skill looked like training 6 months hahaha. As a Masha’s huge fan, I can understand why Irina Viner loves Masha so much even though she sometimes would make big mistakes in competitions. Because it’s rarely to find a gymnast with such good quality. RG is a sport about beauty, such a pretty girl and very elegant, if she has good results she can attract more fans to follow RG. RG is an unpopular sport, if there is a girl who has beautiful face, a very good body line, plus graceful style and good skill. It would be a very good promotion for RG. Of course she must improve her skill and stability first. There was a turning point for Masha last year, Irina Viner asked Vera Shtelbamus to coach Masha. What a coincidence, my two favorite gymnasts both trained by Vera Shtelbaums!!! Reminded me in 2011, one of my friends had noticed Masha already, she even doubted Masha was Vera Shtelbaums’s new little pupil. Who can guess at that time Masha would become Vera Shtelbaums’ pupil two years later. There was another episode last year, Masha’s mom told me Olympic champion Yulia Barsukova has ever trained Masha for a while!!! Swan queen trained little swan, is there any more good thing than this?!!! From Barsukova then the legend coach Vera Shtelbaums, and actually Irina Viner also has ever trained Masha for a short time. All these showed Viner is really having high expectation on Masha. It’s obvious that Masha improves a lot after Shtelbaums coaching her. Her apparatus skill is stronger, her speed is faster. But she still has to improve her stability! She has improvement in this though, comparing with the time when she was junior, now generally she can execute three routines without errors among four. She even cleaned all routines in AA in Berlin Masters this year. But it’s not enough, there are many talented girls in Russian team, if she is not strong enough soon she will be replaced. The most important thing is to try her best not to make huge mistakes. Everybody would make mistakes, it’s normal, but once the mistakes are huge there is no way to win a medal. Zhenya’s best advantage is she rarely made huge mistakes, that’s why she hardly to lose AA, actually she never lost AA in OG, World Championships and European Championships. AA is more meaningful than apparatus finals. There is only all around competition in RG in Olympic Games. Anyway, not much time left for her, she failed to go to World Championships this year, she only can blamed herself, She did a very bad performance in World Cup Kazan which was the last WC before World Championships. As a head coach of Russian national team, even Irina Viner has a bias in favour of some gymnasts, but generally she could make right decision in the important moment. Next year is the year before Rio OG, I know Masha’s chance is very very little, but still my dream is to watch Masha competing in OG. Because Viner ever said in her post Izmir Worlds interview, except Kudryavtseva and Mamun, other girls also have chance to be selected in RUS OG team, she mentioned Masha particularly (check here). But at first she should start in Euros and Worlds, I hope she can make it next year to compete in these two major events. I would prayed for Masha every day. Davai Masha!!! I hope you can become a real swan one day!!! Every Blessing!!! 2013 Swan Lake hoop: a routine specially created for her. A very balletic routine, many ballet movements. Music and the choreography suit her style very well. I have to mentioned the leotard specially, sooo beautiful the most beautiful leo I have ever seen. Master piece! 2014 “Angel and Demon”: after two not very good music choice, they chose this music in May. A style changed in for her. Usually people’s image about Masha is graceful and classic. But this music is very powerful. At first, some people think Masha can’t cope with this music. But as she masters with this routine more and more, she can interpret this music very well, her strength and speed increased. Her apparatus handling improving, many throw and catch by legs. This is a very good routine and my favorite from hers this year surpassed the Russian Dance ribbon. All her routines polish completely after choosing “angel and demon” for hoop. Each one has different style, hoop is powerful, ball is soft, clubs is passionate and ribbon is classic. in the 2nd half of last year Masha changed her ball music, she chose a soft music “Adieu” for her ball. In the beginning I prefer her old music. But after she performing this routine perfectly few times, I loved this routine. Her ability is developed in this routine, many handling by legs and other parts of her body. If Masha does it without error this routine is very very beautiful. Masha changed her clubs music with “Baila Maria” in 2nd half of last year. The title means “dancing Maria”, also a changed style for her. This routine is much better than her previous clubs routine, her apparatus handling is stronger and speed is faster. Movements match music well, a well choreographed routine. 2014 “Russian Dance”, at first her ribbon music is “Katyusha”, I don’t like “Katyusha” I hope she changed music. They heard my praying XD she changed it in GP Moscow. Same with last year she chose one ballet music among four routines. Irina Viner said in post interview of GP Moscow, “I found her the classical music from the ballet, and she just stuck with it. Previously, she used the music ‘Katyusha’ for the ribbon routine and it did not turn out nicely because it is a piece of very catchy music, and she is like an aristocrat.” (I. Viner’s interview please read here) And amazingly, ribbon is the most stable apparatus for Masha this year, before her ribbon performance is very very poor = = I guess the reason is because they really find the right music for her! source of information in this article: interview, news and some I got by asking Masha directly. You can find all the information in this website. @M, Thank you for your reading! I wrote this article with my heart! Nice write up. She needs to improve her nerves and consistency. I love her but as you said others will come up or pass her. Irina won’t have a choice but to choose others. Her consistency is the problem and I hope this season will be better for her. Happy 20th Birthday dear Masha!! !